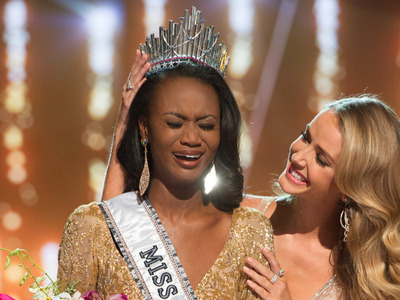 Miss USADeshauna Barber was the first military member crowned Miss USA. Miss Universe knows what you think of it. And it’s quietly making a number of changes that might make you rethink the pageant. Many people criticise Miss Universe for being an antiquated celebration of superficial femininity. While the annual show remains popular with its core audience more than 50 years after it was founded, its image as a brand has seen better days. That may be changing. Donald Trump unloaded the organisation in 2015 after a falling out with its broadcaster, NBC, following his controversial statements about Mexican immigrants. He sold to WME/IMG, which is primarily known as a talent agency but is widely growing its business ventures, including original productions. The new Miss Universe/Miss USA owners want to take full advantage of that audience in ways the old shows simply left behind. They launched the Miss U app, the first official app for the Miss Universe organisation, which allows fans a say in the voting and gives them access to content before and after the shows. “Celebrating women 60 years ago was a very different idea of how to do that than now. What we saw in the opportunity here was, first of, to kind of join the conversation that’s happening in 2016. That’s men and women talking about celebrating women and women’s empowerment and getting women to work together to raise all levels and awareness on women’s issues and other issues around the world,” Antinoro said. That shift in how Miss Universe treats female competitors, means, for example, that Miss USA went to the 51 competitors’ hometowns to spend a day with each of them and shoot footage of their daily lives: their jobs, their families, and everything else that goes beyond the skills of the show. This year’s newly crowned Miss USA, Deshauna Barber, is an officer in the Army Reserve and impressed viewers by giving an answer in which she defended women being allowed in all combats roles of the military. It was a far cry from the type of blanket, abstract answers competitors have given in the past, and got to the core of Barber’s service and ideas about the country.